Last night, two West Bank Palestinians, Muhammad and Khalid Muhamra, walked into Tel Aviv’s Sorona Market and began firing their machine guns at innocent civilians at an eatery, killing 4 and injuring many more. Palestinians in parts of the West Bank and Gaza celebrated the attack. Hamas described the assault on innocent civilians as “heroic”. Fatah, the party of PA President Mahmoud Abbas, justified the “operation” as an understandable reaction to the occupation. Yet, editors of the print edition of the UK newspaper The Metro clearly has its pulse on what’s really ‘shocking’ about the entire incident – the “BLOODIED suspect”. 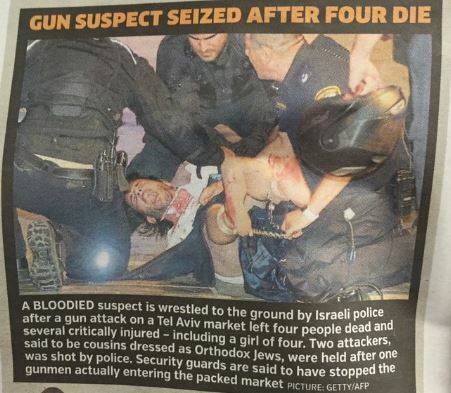 In addition to the troubling editorial decision to focus on the capture by Israeli police of one of the terrorists, the victims didn’t just “die” (as the headline suggests), but of course were killed by the terrorist in the photo. Additionally, their brief synopsis under the photo gets a key fact wrong. The claim that the terrorists were dressed as Orthodox Jews was debunked – in part by a video of the incident – shortly after initial rumours surfaced. So few words, so much disinformation. The story of how the terrorists were dressed is interesting. I guess that, when people use the term “dressed as Orthodox Jews”, they think long coats, streimels, and beards. Although that’s not the case in this video, the terrorists were obviously not dressed like Pal terrorists – no keffiyehs,for instance. Dark suits and ties, for heaven’s sake – what pal terrorist wears a tie? So maybe the dress wasn’t so much “like an orthodox Jew”, more like “a modern orthodox Jew”. What kind of dress is usual for Labour MP’s? Good question, jeff21st. Maybe the report in Metro should have pointed out that the terrorists were dressed as Labour MPs. Of course, that might lead to a discussion about how we knew they were Labour MPs, but that would be easy to answer; a fish rots from the head. They, of course, they are going to pander to what their audience cares about. I agree. And in pandering, Metro et al is able to disinform and disseminate antisemitism in the guise of reporting on Israel. SHOCKING. “US cautions Israel not to escalate tensions after Tel Aviv attack”….This current US President and his administration would have to be the worst towards Israel….Obama keeps repeating that “he has Israel’s back”…Yeah… with a knife in it …With a little twist now and then…..Anyway the feelings are mutual…. Drones work for the US. How about crop dusters that spray bacon grease on the celebrants of the TA attack?